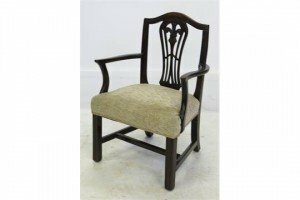 A Victorian 15ct gold brooch the raised circular centre gypsy set with a diamond brilliant within cable moulded and applied palmette, flower head scroll decoration, beaded border, glazed locket back. 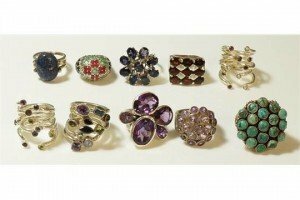 A collection of ten African silver rings with various designs and inset stones including lapis lazuli and amethyst. 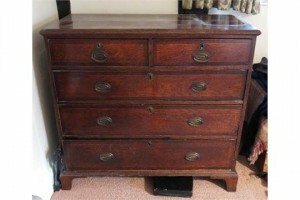 A North Country Georgian oak chest of drawers, the top and drawer fronts with cross banding, fitted two short drawers over three long drawers, raised on bracket feet. 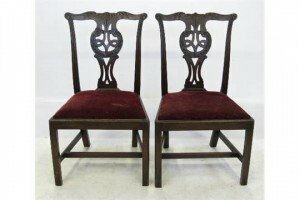 A 19th century mahogany child’s chair, with pierced central splat carved with Prince of Wales feathers, with out swept arms, raised on square legs united by H stretcher. 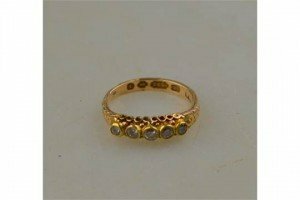 An antique-style diamond cluster ring having central old cut diamond in possibly Georgian foil back setting in centre, surrounded by two rows of old rose and eight cut diamonds. 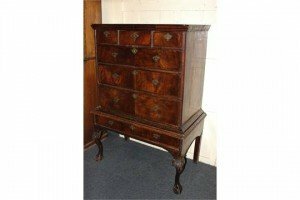 A George III mahogany chest on cabinet, the top section with two short over three long drawers, above base with two panelled cupboards, on bracket feet. 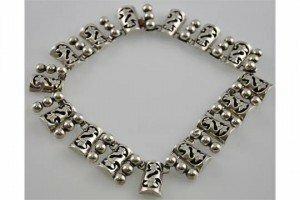 A Mexican Sterling silver ‘shadow box’ necklace, the alternate box sections with entwined foliate motif, interspersed with rows of three spheres. 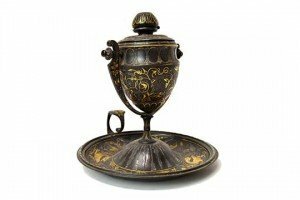 A Continental patinated metal oil lamp, 19th century, the burner body of urn form, on a gimble frame with a dished base and shaped gilt metal ring handle inlaid with mythological beasts and foliate bands. 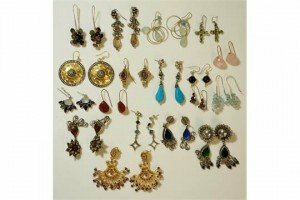 A collection of eighteen pairs of African silver and silver gilt earrings, various designs and inset stones/glass, including amethyst and labradorite. 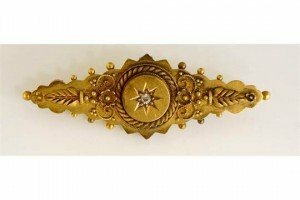 A boxed Victorian yellow metal enamelled necklace, the champleve sections decorated with a floral motif. 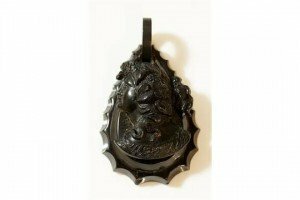 A Victorian carved jet drop pendant in the form of the head and shoulders of Bacchus, vine leaves and grapes in his hair. 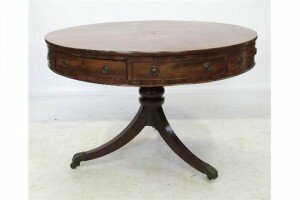 A late Georgian style mahogany drum table, fitted four dummy drawers and four drawers, raised on column with three out swept feet, with brass caps and casters. 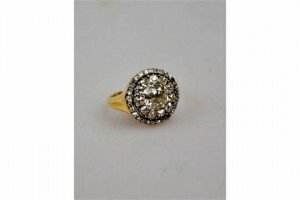 A single stone diamond ring, yellow and white metal setting stamped 18ct, approx 0.20 carats, having small eight-cut diamond to shoulder. 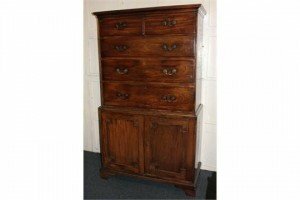 An 18th century walnut chest on stand of three short over three long drawers with drop handles, on base with further long drawer, on carved cabriole legs with claw and ball feet. 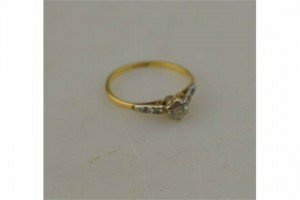 A Victorian five stone diamond ring in closed back setting having scroll work under bezel, shank engraved overall with no signs of sizing, 15 carat yellow gold. 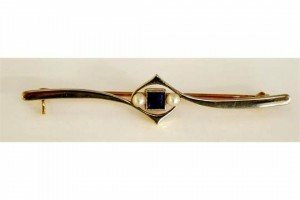 An Edwardian 18ct white and rose gold bar brooch of pierced interlaced design centred on a square cut sapphire flanked by two seed pearls. 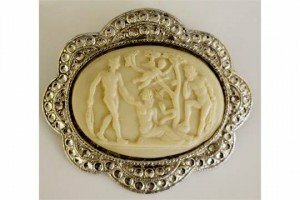 A Charles Horner silver backed brooch with composite relief intaglio depicting classical scene, marked Chester 1948. 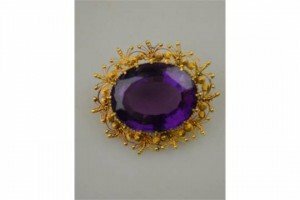 An oval brooch containing a large amethyst of good colour in yellow gold cannetille work setting. 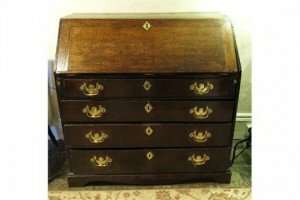 A late Georgian oak bureau, the fall flap fitted with pigeon holes and drawers, fitted four graduated long drawers below, raised on bracket feet.